Our family loves pasta, so I knew putting some kind of pasta dish in the freezer was a no-brainer. This Freezer Friendly Baked Penne was pretty easy to make, especially since I cooked all the ground turkey on Sunday. All I had to do was cook the pasta and heat the turkey and sauce! 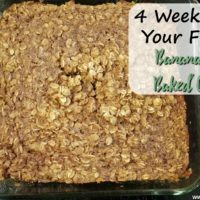 For this recipe, you can either use 2 pounds of ground beef/turkey, or use one pound with some shredded carrots and zucchini like I did. I cooked about a pound each of both veggies with 3 pounds of ground beef for all three freezer meals for this week. 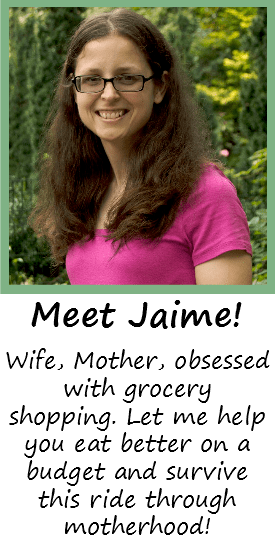 Click here to see my example! After the pasta finished, I divided it into two dishes. Both are supposed to be 8×8, but my foil ones were 9×13 which still works. I mixed in the ricotta cheese with the pasta. 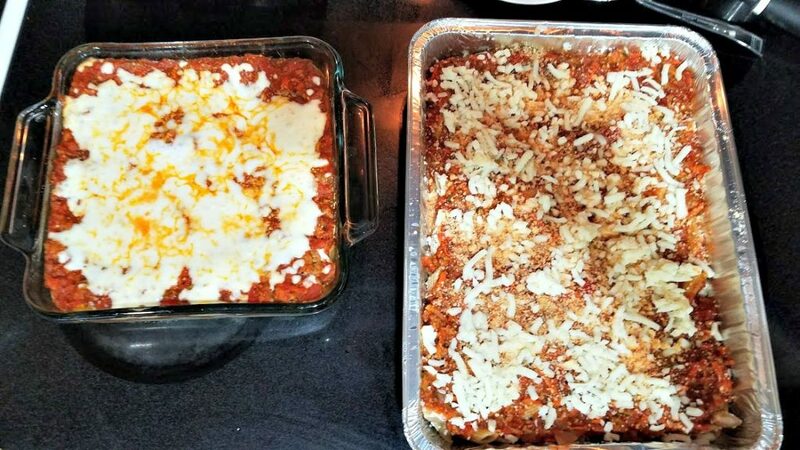 Next I evenly spread the meat sauce over each, and topped it with 1 cup of shredded mozzarella. It looks like a ton of sauce now that I look at it, but I love sauce so this was perfect. I only baked the one we were going to eat that night. The other one was covered in foil and labeled with baking instructions. Make sure to put the pan on a cookie sheet when you freeze it so it freezes flat! Each dish serves 6 people, so you may have plenty left for the next day unless you have a larger family. We served ours with steamed vegetables and garlic toast. 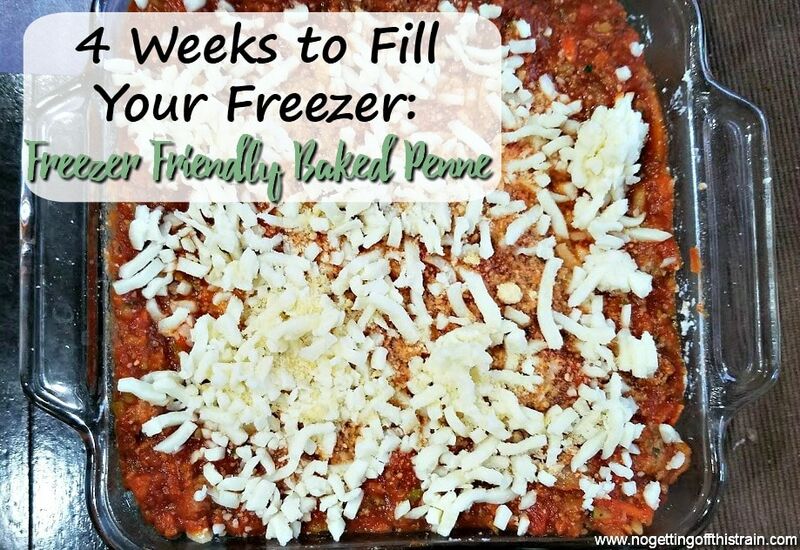 Have you been participating in the 4 Weeks to Fill Your Freezer challenge? Leave a comment and let me know how you’re doing! This Freezer Friendly Baked Penne is an easy family meal that makes a double batch! 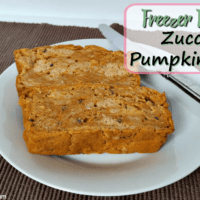 Eat one for dinner and put the other in the freezer for later! In a large pot, boil the pasta until fully cooked. Meanwhile in a large pan, cook the ground beef or turkey with the onion and drain. 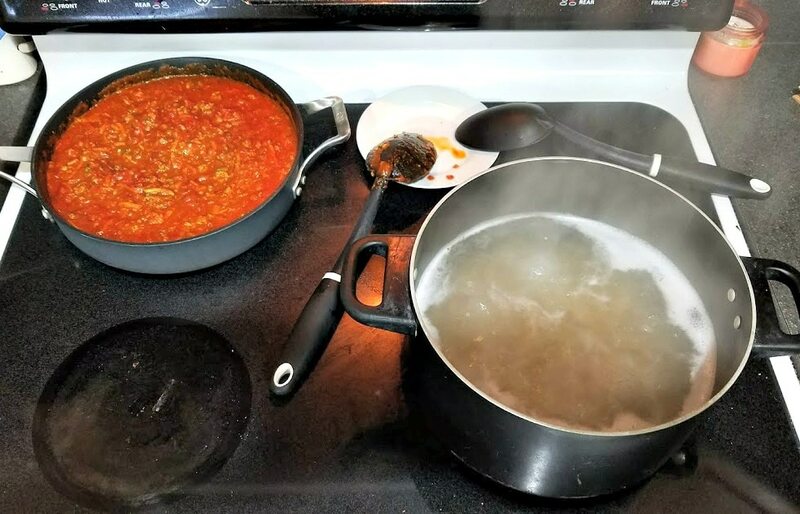 Add the jars of spaghetti sauce and let simmer for a few minutes. Grease two 8x8 foil pans. 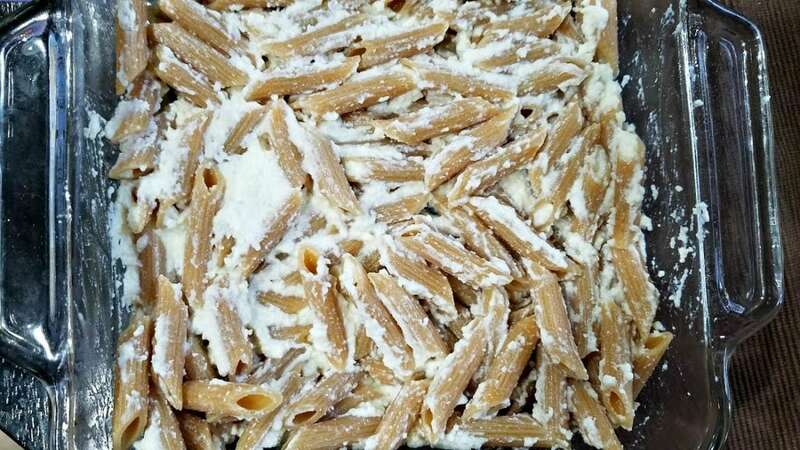 Divide the pasta into both pans and evenly divide the ricotta cheese. Mix both to combine. 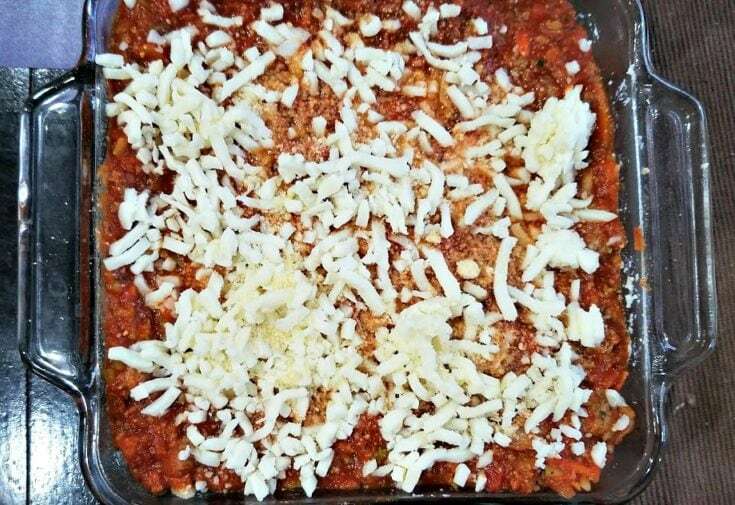 Evenly spread the meat sauce over both pans and sprinkle each with 1 cup mozzarella cheese and 2 tablespoons Parmesan cheese. Bake for 30 minutes until hot and bubbly and the cheese has melted. 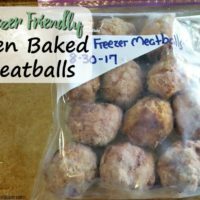 If you're freezing these meals, don't bake first. Cover in aluminum foil and label. To reheat, thaw completely in the fridge. Bake at 350 degrees for 30 minutes until hot and bubbly. Wow, what a brilliant series. Can’t wait to try these recipes… almost all of them! Thanks, Rebecca! We’re still enjoying the meals and I made them all in November. =) I hope you enjoy them, too!